Orthopedic devices include joint replacement devices, spinal devices, orthobiologics, arthroscopic devices, trauma fixation devices, orthopedic accessories, as well as orthopedic braces and support systems that are used for the treatment of various disorders related to joints, ligaments, muscles, nerves and tendons as well as other musculoskeletal diseases or injuries. Orthopedic devices are also used to support or replace the missing bone or joint and helps in restoring the body function by replacing or reinforcing the damaged structure. Several factors are driving the growth of market, such as growing geriatric population, increasing prevalence of osteoporosis, arthritis and other orthopedic disorders, rising number of sports injuries and road accidents, increase in demand of minimally invasive surgical procedures and recent advancements in medical technology. The orthopedic devices market is rapidly growing since hospitals, specialty clinics and other end users are extensively adopting various devices, implants and surgeries for better treatment, cure and outcome of different orthopedic disorders. Development of cost effective innovative products, advent of outpatient orthopedic procedures, emergence of personalized medicines and robotics technology are providing an excellent opportunity for the growth of orthopedics device market. The research study comprises of a comprehensive analysis of various aspects of the global orthopedics device market. The segmentation has been done in terms of product type, material type, end users type and geographical regions, in order to gain a holistic view of the entire market. In terms of product, the orthopedic device market has been categorized into orthobiologics, spinal devices, joint reconstruction, trauma fixation devices, arthroscopic devices, orthopedic accessories and orthopedic braces and support system, among others. The joint reconstruction and replacement devices as well as knee orthopedics device segments have the highest adoption rate which can efficiently facilitate effective decision making and management of orthopedic disorders in patients. The hospitals, specialty clinics and general practitioners and physicians, as well as research and institutions are the major end users of orthopedic devices due to expansion in patient flow in these facilities. In terms of geography, North America and Europe leads the global market. The market growth in these regions are driven due to factors such as rising prevalence of obesity, osteoarthritis, arthritis and other musculoskeletal disorders, increasing geriatric population, higher value per device and recent advancement in medical technology. Furthermore, Asia Pacific and Latin America are also evolving at a faster rate which can be attributed to the rising geriatric population, prevalence of orthopedic disorders, growing technological advancements and increase in awareness about minimally invasive procedures. The report presents with an opportunity to examine comprehensive insights with respect to the market and helps forming well informed strategic decisions. The research uncovers certain substantial parameters that must be taken into consideration before entering into the global orthopedic devices market. These include market drivers and restraints, market share analysis, competitive landscape, and key developments etc. • What are the major market drivers, challenges and opportunities in the global orthopedic devices market and their case studies? • How did the orthopedic devices market evolve and what is its scope in the future? • What is the market share of the leading segments and sub-segments of the global orthopedic devices market in 2016 and 2023? • How will each segment of the global orthopedic devices market grow over during the forecast period and the revenue generated by each of the segments by the end of 2023? • Who are the leading players in the global orthopedic devices market and their respective market share? • How will the industry evolve during the forecast period between 2017 and 2023? • Which is the geographical location contributing to the highest sales of global orthopedic devices? • What are the recent technological trends in global orthopedic devices market? 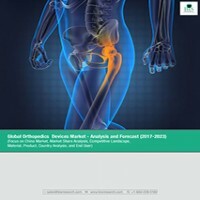 This research report aims at answering various aspects of the global orthopedic devices market with the help of key factors driving the market, threats that can possibly inhibit the overall market growth, and the current growth opportunities that is going to shape the future trajectory of the market expansion. The study considers the growth share matrix model for a comprehensive study of the global orthopedic devices market and assesses the factors governing the same. The key players operating in this space comprises of Zimmer Biomet Holdings Inc, Globus Medical Inc, Smith & Nephew plc, Stryker Corporation, RTI Surgical Inc, Wright Medical Group N.V., Johnson & Johnson, Medtronic Public Limited Company, Arthrex Inc, and AlloSource, among other significant players worldwide. 12.9 Wright Medical Group N.V.
An Orthopedics device is used for various disorders related to joints, ligaments, muscles, nerves and tendons as well as other musculoskeletal diseases or injuries such as arthritis, osteoarthritis, joint pain, tendinitis, and tenosynovitis. It is used to support or replace the missing bone or joint. It helps in restoring the function by replacing or reinforcing the damaged structure. Orthopedics devices are used for the treatment of musculoskeletal diseases or injuries. Technological innovations across the various segments of the Orthopedics industry have propelled the market growth. The global Orthopedics devices market is expected to reach $61 billion by 2023. A growing geriatric population and increasing demand for non-invasive treatments are boosting the market growth. The knee segment leads the market in terms of revenue. The hip segment is growing at a CAGR of 6.1%, due to an increase in number of hip fractures. The Orthopedics devices market broadly focuses on joint reconstruction and replacement, spinal surgery and rehabilitation, trauma or fixation, arthroscopy, Orthopedics soft goods, braces and supports and ortho-biologicals. The major product groups are artificial joints, spinal implants, devices for fracture repair (mainly intramedullary nails, plates, and screws), orthobiologics, and devices or equipment for arthroscopy. The joint reconstruction and replacement devices market is the largest segment within the Orthopedics devices market is expected to grow at a CAGR of 6% from 2017 to 2023. This segment consists of various devices used for the reconstruction or replacement of hips and knee which accounted for $5,497 million and $9,695.0 million respectively in 2016. The most important driving factor for the revenue growth in this segment is the resurfacing technology. The growing awareness regarding the availability of innovative products among patients is pushing hospitals to constantly upgrade the devices and services they offer. In addition to this, the reimbursement coverage of Orthopedics treatments has further fuelled the adoption of Orthopedics surgeries. All the above-mentioned factors are positively impacting the market growth. North America dominates the market for Orthopedics devices because of the prevalence of obesity and osteoarthritis and higher value per device in the region. The Asia Pacific market is expected to witness significant growth due to increasing population density and expanding healthcare markets. The global Orthopedics devices market offers tremendous opportunity for manufacturers by creating new and sustained export options for companies which will result in the removal of market barriers and help firms to capture large share in the market. The China Orthopedics market contributes about 4.5 percent to the total world Orthopedics market. The growth of this market in China is driven by increased aging population. China has the largest elderly population in the world, with more than 200 million people over the age of 60, approximately 15% of the China's 1.4 billion people. In China, Orthopedics supplies currently make up about 20% of all materials used in minor surgeries. Orthopedics supplies are the second most used type of devices after general surgery supplies. The various driving factors as well as opportunities in Orthopedics device market is providing an edge to the key players such as Zimmer Biomet Holdings Inc. Medtronic Public Limited Company, Globus Medical Inc. Wright Medical Group N.V., Johnson & Johnson, Smith & Nephew Plc., Stryker Corporation, RTI Surgical Inc., Arthrex Inc., and AlloSource, among others, to capture large market share, compete, develop new devices, implants, instruments and surgical procedures in the growing market of Orthopedics devices.